After regaining their footing in the Gateway Classic tournament last week, the soccer team continued to emerge victorious against their opponents, edging out a 2-1 win in last night’s double overtime nailbiter against St. Louis University High (SLUH). Going into the game, senior midfielder and team captain Drew Stanowski knew that RBHS had a tough game ahead; however, the Bruins were carrying momentum from a five-game win streak and were confident in their ability to execute on the field. In the first half, both teams looked for a spark against each other until SLUH scored the first goal in the 28th minute of the game, putting them up 1-0 against the Bruins. 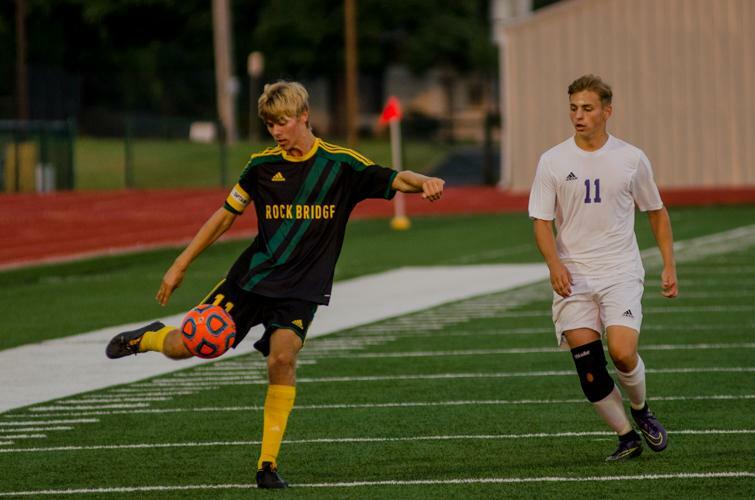 However, RBHS was determined to stand their ground and responded back in the 39th minute in the form of a goal by Stanowski, tying the score between the two teams. Afterward, RBHS and SLUH continued to battle in hopes of scoring to turn the tide of the game in their favor; however, both teams were committed to countering any efforts made by their adversaries, leaving the scoreboard remain unchanged throughout the entirety of the regulation period. The same held true for the first overtime, with neither teams being able to gain a leg up on their opponent. The second overtime, however, was a completely different story. With four minutes left on the clock, junior midfielder Johnny Klein scored a pivotal goal for RBHS, propelling the Bruins to a more secure 2-1 lead. It was a discouraging blow to SLUH, who remained unable to bring the game back into their control for the rest of the game. Stanowski, who was watching Klein when he scored, believes it was a play to remember. After the electrifying victory, the team hopes to extend their winning streak to six games against district competitor Smith-Cotton on the evening of Oct. 6 at home. That game will be the team’s senior night and will cap off a four-game road trip for the Bruins. Do you think the team will be able to increase their winning streak to six games against Smith-Cotton? Let us know in the comments below!